Our carton flow tilt tray is an optional accessory that can be installed on the pick side of any Mallard carton flow system to enhance order picking. Cartons, totes or “eaches” are loaded into the system on the charge/load side and flow on inclined wheel beds toward the discharge end or “pick face”. As the carton nears the pick face it is nudged onto the tilt tray by the subsequent rear cartons being loaded into the system. The pick face carton is now easier to identify and sits at a more ergonomically comfortable position for picking. The drop angle is completely customizable. The unique design of the tilt tray minimizes bending and reaching for the pickers, but also provides an additional safety feature that prevents the pick face item from pitching too far forward and out of the rack. 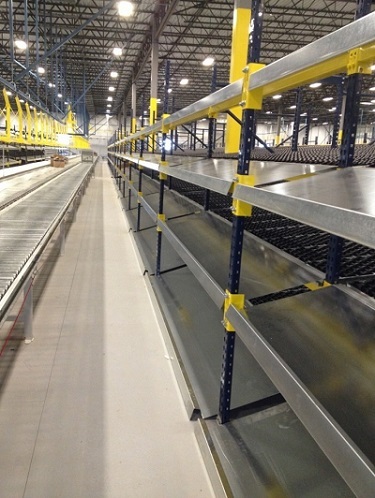 It’s a perfect combination of engineering and design meeting a common warehousing need. 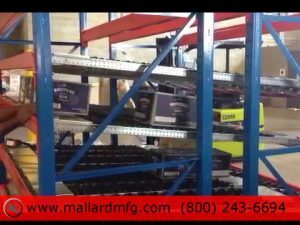 Carton flow tilt trays can be added to any Mallard carton flow system.